Many of my favorite Texas towns — Vanderpool, Medina, Camp Wood, Leakey — lie along Texas Ranch Roads 335, 336, and 337. Collectively known as the “Twisted Sisters,” the roads serve as a magnet for motorcycle riders. Now and then, evidence of unhappy endings appears. At one scenic pull out, two crosses stood near the small parking area as memorials: one made of plain wood with incised dates, the other bejeweled and trimmed with gold. But at the edge of the cliff, nearly hidden in the grasses, a different sort of marker caught my eye. From the iconography, I’m confident the person it honors was both Texan and Christian. Given the prickly pear’s spines, I know the artist was both creative and brave. That’s quite a slice of life you’ve caught there. There’s no question it’s one of the more unusual things I’ve found while out and about. It will be interesting to see how long it survives, or if it changes. The plant itself was good and healthy, and well away from the road or foot traffic, so it might be around for a while. There’s something about winding roads and driving fast, moths to a flame. Where I’m from, it’s not so much curves, as gravel roads that go over a series of little glacial ridges, where, I’ve heard, if you get going fast enough, you can get 4 wheels off the ground. I wonder if the band Twisted Sister ever toured through there, they’d blend in perfectly with the cowboys. Have you ever tried eating prickly pear? I’m not so sure Twisted-Sister-the-band would blend so well with the cowboys. We’ve come a long way from the hippies vs. rednecks days, but booking Megadeth or Alice in Chains out at Luckenbach still seems like a long shot. On the other hand, there is a group called Metalachi that combines heavy metal and mariachi music. Their live performances aren’t exactly family-friendly, but their covers can be great, like this one of Guns’n’Roses. My dad and I used to go out and ride those gravel roads when I was a kid. I don’t know if we lifted off, but I remember squealing with joy when we’d top a hill and get that airborne feeling. I’ve had jelly made from the fruit of prickly pear (the tunas) but never have tried the pads. A neighbor of a hill country friend makes nopalitos every weekend, and the next time I’m up there I’m game to try. He says he uses his mother’s recipe — if it’s mama’s recipe, it’s bound to be good. We have a similar place. San Luis pass, at the west end of Galveston Island, is where the waters of Galveston Bay enter the Gulf of Mexico. People love to fish or swim there, but it’s dangerous because of dropoffs, swift currents, and unpredictable tidal movement. Despite all the warnings, people die there every year. Finally, they banned wade fishing and swimming, since the posted warnings weren’t keeping people out of the water. One of the difficulties here is the number of tourists who truly don’t understand things like rip currents. I wonder if that’s part of the situation at the Vermont waterfall, too? The natural world is beauitful, but it certainly can be unforgiving. How sad … but what eagle eyes you have, Linda, for finding this marker. I’ve never been what people call a daredevil. No Bungee jumping, no skydiving. I did inherit a heavy foot from my dad, but after my last accident (the T-bone that wasn’t my fault), I’ve become more tentative. Maybe if I’d been going faster, she wouldn’t have rammed into me! No bungee jumping or skydiving for me, either, Debbie. I figure driving the Houston freeways is enough risk for anyone. I’m not a fast driver, either. I’ll keep to the speed limit or a little above on the interstates, but when the limit’s 75 or 80, that’s a bit much for me. One nice thing about driving in the area of the Twisted Sisters is that everyone’s polite, and there’s not a lot of chance-taking. It’s considered good manners to pull off where you can and let traffic pass if it’s stacking up behind you, but generally speaking, there’s not much traffic, anyway. Ranchers and other locals, motocyclists, and the occasional road rally are about it. It’s possible to get to the natural areas and state parks without going through the hills, and I think a lot of people do just that. I’m glad, because I really enjoy poking along. That is one of the most touching monuments I’ve seen! Isn’t it, though? When I saw it, I wondered if it might have been carved before all those long spines developed. Whenever and however it was done, someone took great care to do it well. As it happens, this is in the neighborhood of the Lost Maples Sheep Dip Philosophers and Whittlers Association, as well as the Lone Star Motorcyle Museum. It seems unlikely that anyone at those locations would know the history of the carved cactus, but on the other hand, it might be worth exploring. I like the hiddenness and anonymity of the tribute, but it would be interesting to know the story. I’ve never let a few facts get in the way of my mind-wandering, Curt. Well, I’d been looking for a place where I could pull over and photograph some of the flowers that were tucked into the rocks. There weren’t many options, but I found one, parked, and took the camera to see what I could see. There were butterflies galore, and while I was chasing them, I kept edging farther off the road until — there it was. Believe me, I’m filled with admiration for whoever managed to do the carving without falling down the cliff. I think it must have been there for a while: not only because of the blackened areas around the carving, but also because there was no evidence at all of someone walking or sitting in the area, or clearing a place to work. Amazing story, Linda, Thank you. Brave indeed. And I have to say, you must have eyes like a hawk to have spotted that! I was going to tease and say that, when I had my cataracts removed and new lenses implanted, I asked for special lenses that would let me spot natural oddities and camouflaged critters. Then I decided I’d better not — the thing about humor is, not everyone “gets it” these days! Prickly pear pads tend to be so uniform that any little difference shows up more than you might expect. Occasionally, animals take bites out of them, or trample them. Sometimes they grow in locations that force them to take on strange shapes, and every now and then they just grow oddly. I have one in a pot that’s formed a pad in the shape of a heart; I need to photograph it before something happens to it. Anyway — it’s the oddities that catch the eye, and that’s why I noticed this one. Well, that and the butterflies I had to chase into the brush because they wouldn’t sit still for a photo. There is a rather challenging 80km walk in Tasmanian’s wilderness which features many crosses where hikers have perished usually through hyperthermia. It is called the Cradle-Back mountain to Lake Saint Claire walk. Meeting the crosses wasn’t all that pleasant but it did help to keep going. I’d have to agree, Gerard. If anything could provide a little motivation to keep going, those crosses should do it. I thought at first the wilderness you spoke of might be desert, but what I saw when I looked up Cradle-Back and Lake St. Claire astonished me with its beauty. What an experience that walk would be. I saw several six to eight day walks advertised; would those be the 80km walk you mentioned? I suppose there are many routes available. Yes, Linda. I did that walk many years ago. We had to carry all our tents and provisions. As far as I know there is only one track. There are now suitable overnight accommodations available and much of the walk is planked out above the wet-lands. One of the world’s greatest walks. What a wonderful experience that must have been. I did notice that there are huts available now for overnight resting. Just reading about it makes me want to get out and walk — anywhere. What sharp eyes you have! I am wondering if this was done with a hot poker? It’s a very natural, eco-friendly marker. To have a hot poker, you’d have to build a fire, and anyone who’d build a fire out there would be the very definition of stupid — not to mention heavily fined and perhaps in jail for arson. I’m sure a knife was used, and it may even have been used spontaneously, since most people who roam that area carry a knife of some sort. The level of detail suggests a good, sharp knife, too — and a very steady hand! I’ll be interested to see how long the marker lasts. I’m in the area often enough that I’ll be able to check on it. Yes, thinking more about this, someone who took such care with the carving would not be silly enough to use a hot poker. What I do wonder is whether there might be some cacti somewhere that have been branded, just for kicks, while the cattle branding’s going on. Perhaps no one would do it while they have the cattle roaming around, but I’ll bet someone’s given it a try at some other time. I bet. I can see a collection of cactus art appearing in one of your posts one day. Such imagination in a ‘prickly situation’. A “prickly situation” describes it perfectly, in a number of ways. The more I think about it, the more I think the carving might have been done when the pad was younger and the spines weren’t so well developed. But if not, it took a little time to work amid all that prickliness! Sic transit gloria mundi; ergo dum vivimus vivamus. Or, in this case perhaps, Sic transit gloria cacti, but the advice that follows is just as appropriate. This is such a fascinating piece of Texas, Linda. Sharp eyes to spot it! Let’s assume he/she died doing what he/she loved. I bet that road is scenic, and I wonder how long the carving will last – probably many years. Iconography is interesting. I’m convinced the person being memorialized was a guy. If it had been a woman, I’d bet on boots rather than a hat — particularly that kind of hat. It’s hard to say, of course, especially since even the guys love their boots, but that would be my guess. What’s certain is that it is a scenic area: mountainous enough to leave people who’ve not been there before speechless. 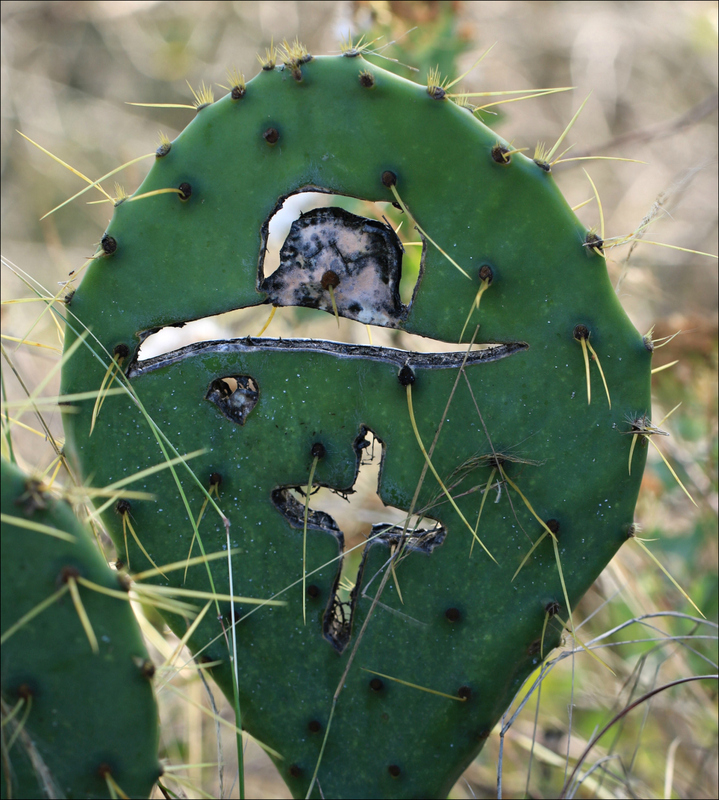 I hope the carving lasts for a while, but there’s a lot that can happen to prickly pear despite its strong constitution. A couple of diseases cause black lesions or spots on the pads, and I’ve wondered whether the black portion of the hat might be a result of disease taking root in the cuts to the pad. I guess we’ll see — it will be a while before I get back up there, but I’m hoping I can do so in late January or early February. It is poignant. I keep thinking about the patience of the person who braved those thorns (or baby thorns) to do the carving. There’s no erasing, and no going back to repair a knife slip. Whoever did it had a steady hand, and a very sharp knife. I’m writing this offline, so unfortunately I’m unable to do a search to provide more information! Today I returned home and scanned the new WP posts and opened the page for your ‘Taking Wing -Angels…’ Next time online I’ll refresh the page so it will load, and then Sun/Monday will be free days – and I’ll enjoy whatever jewel you’ve shared about that old book! I’m quite curious, but I won’t have to wait long! Tomorrow I’ll be back at the cyber before attending a Catholic ‘communion service’ for the son of the man that makes my frames! “Junior” seemed quite pleased to know that I’ll be attending! Then back home and offline til Tues or Wed…. I found the “autograph tree.” It’s scientific name is Clusia rosea, and it’s a beautiful thing. Unfortunately, it’s also become seriously invasive in many parts of the world, and has an unfortunate tendency to strangle native trees to death. Places like Hawaii, where it thrives have “DO NOT plant” notices on information about it. I’ve enjoyed your various postings, and hope you’re having a delightful holiday, and easy travel. Here comes the New Year!